Nerja Airport Transfers - Pre-booking Nerja airport transfers for your holiday and knowing that a taxi driver will be there waiting for you at the airport in Malaga, takes away the stress involved with finding the local Airport Taxis, fighting over a price and then hanging on for dear life as the taxi speeds away and then usually struggles to find your place of accommodation. Malaga airport taxis are allowed to charge more for the same journey than Nerja taxi drivers therefore we only use local Nerja taxi and mini bus companies for your Nerja airport transfer who know Nerja well and will know your holiday location in Nerja unlike the Malaga transfer taxis. We can provide any size of airport transfer taxi from a 4 seater taxi to a 9 seater mini bus or we can even arrange coaches for those larger parties. Whatever your requirements we can find the right solution to get you to Nerja from Malaga and return if required. We are more than happy to provide you with a competitive quote for your Nerja airport transfer and all you need to do is send us your enquiry from the form below advising us of how many people are travelling. We will email you back and should you wish to proceed we will arrange your Nerja taxi for you and all you need to do is turn up at the airport and pay the driver of course. 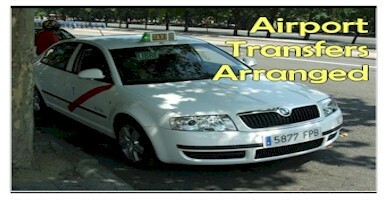 Naturally we can also arrange airport transfers from/to Malaga airport. If you would like to save money on your airport transfer to Nerja, why not get the bus from Malaga to Nerja for about 6 Euros per head. 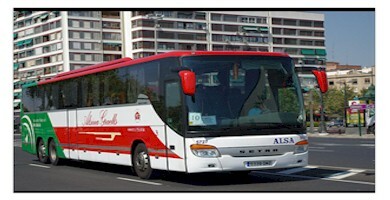 We have full details on how to get the bus to Nerja on our Buses to Nerja page. Looking for a cheaper options? Take the bus under 6 euros!